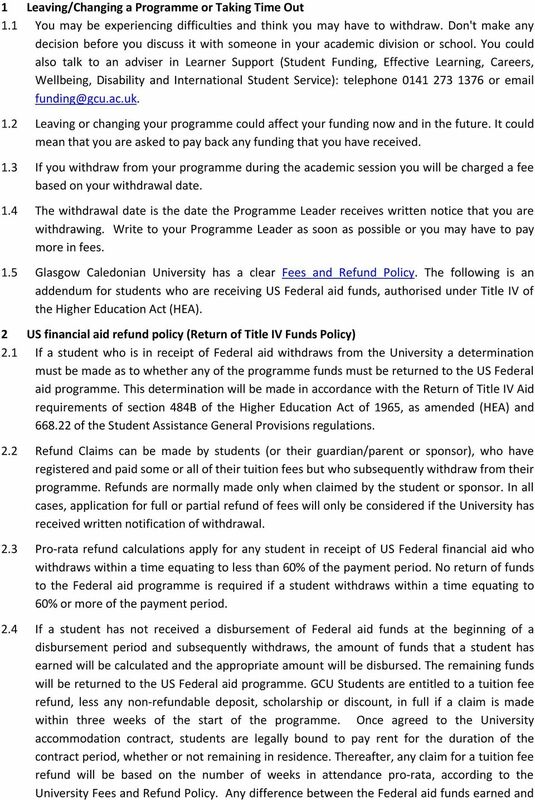 Download "Registry US Federal Loan Refund Policy"
3 Glasgow Caledonian University fees due (as calculated as per the University withdrawal policy) will be charged to the student. 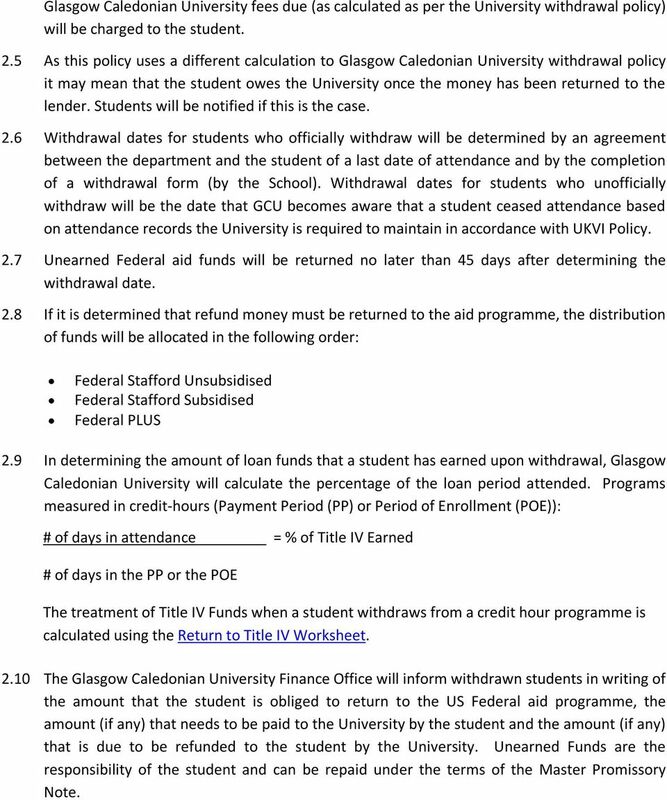 2.5 As this policy uses a different calculation to Glasgow Caledonian University withdrawal policy it may mean that the student owes the University once the money has been returned to the lender. Students will be notified if this is the case. 2.6 Withdrawal dates for students who officially withdraw will be determined by an agreement between the department and the student of a last date of attendance and by the completion of a withdrawal form (by the School). 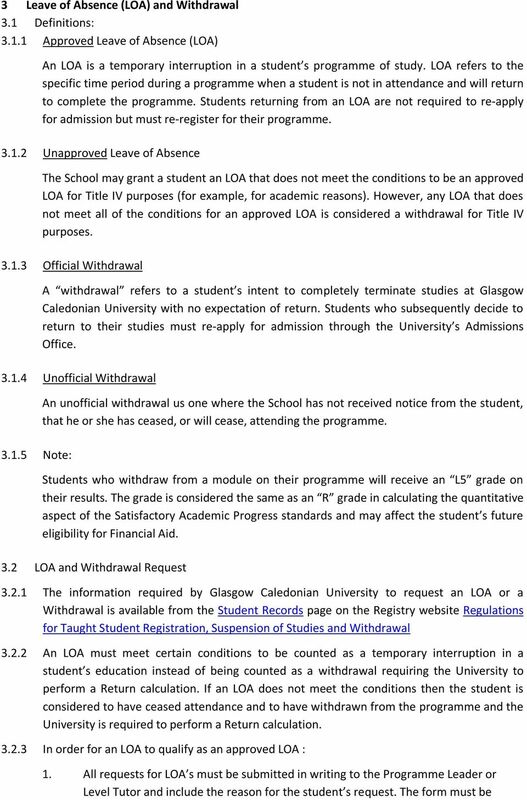 Withdrawal dates for students who unofficially withdraw will be the date that GCU becomes aware that a student ceased attendance based on attendance records the University is required to maintain in accordance with UKVI Policy. 2.7 Unearned Federal aid funds will be returned no later than 45 days after determining the withdrawal date. 2.8 If it is determined that refund money must be returned to the aid programme, the distribution of funds will be allocated in the following order: Federal Stafford Unsubsidised Federal Stafford Subsidised Federal PLUS 2.9 In determining the amount of loan funds that a student has earned upon withdrawal, Glasgow Caledonian University will calculate the percentage of the loan period attended. Programs measured in credit-hours (Payment Period (PP) or Period of Enrollment (POE)): # of days in attendance = % of Title IV Earned # of days in the PP or the POE The treatment of Title IV Funds when a student withdraws from a credit hour programme is calculated using the Return to Title IV Worksheet The Glasgow Caledonian University Finance Office will inform withdrawn students in writing of the amount that the student is obliged to return to the US Federal aid programme, the amount (if any) that needs to be paid to the University by the student and the amount (if any) that is due to be refunded to the student by the University. Unearned Funds are the responsibility of the student and can be repaid under the terms of the Master Promissory Note. 5 signed and dated by the student and specify the date the student wants the LOA to begin and end. 2. Students must apply in advance for an LOA unless unforeseen circumstances prevent the student from doing so. 3. The situation described as the reason for the LOA must be generally non-academic in nature and must be one that leads to a reasonable expectation that the student will return from the LOA within the allowed time frame. 4. 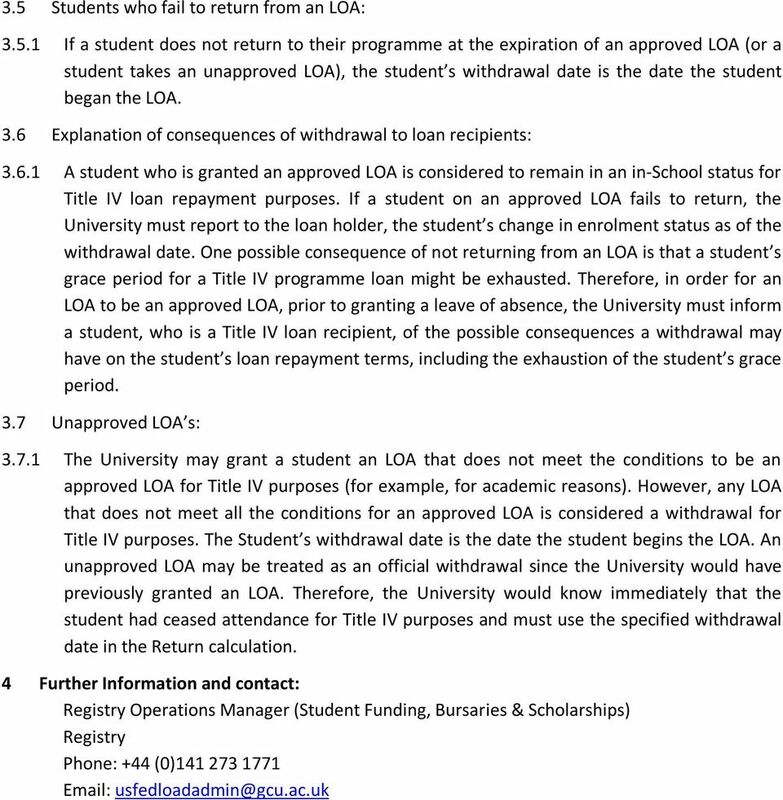 The LOA together with any additional leaves of absence must not exceed a total of 180 days in any 12 month period including days in which the University is not in session All requests for LOA will be reviewed by the Programme Leader, the University Head of Registry and the Director of Financial Aid. 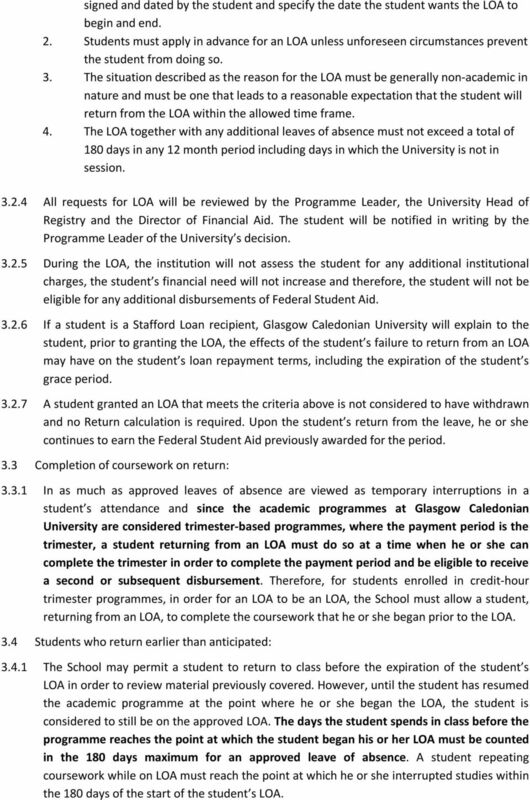 The student will be notified in writing by the Programme Leader of the University s decision During the LOA, the institution will not assess the student for any additional institutional charges, the student s financial need will not increase and therefore, the student will not be eligible for any additional disbursements of Federal Student Aid If a student is a Stafford Loan recipient, Glasgow Caledonian University will explain to the student, prior to granting the LOA, the effects of the student s failure to return from an LOA may have on the student s loan repayment terms, including the expiration of the student s grace period A student granted an LOA that meets the criteria above is not considered to have withdrawn and no Return calculation is required. Upon the student s return from the leave, he or she continues to earn the Federal Student Aid previously awarded for the period. 3.3 Completion of coursework on return: In as much as approved leaves of absence are viewed as temporary interruptions in a student s attendance and since the academic programmes at Glasgow Caledonian University are considered trimester-based programmes, where the payment period is the trimester, a student returning from an LOA must do so at a time when he or she can complete the trimester in order to complete the payment period and be eligible to receive a second or subsequent disbursement. Therefore, for students enrolled in credit-hour trimester programmes, in order for an LOA to be an LOA, the School must allow a student, returning from an LOA, to complete the coursework that he or she began prior to the LOA. 3.4 Students who return earlier than anticipated: The School may permit a student to return to class before the expiration of the student s LOA in order to review material previously covered. However, until the student has resumed the academic programme at the point where he or she began the LOA, the student is considered to still be on the approved LOA. The days the student spends in class before the programme reaches the point at which the student began his or her LOA must be counted in the 180 days maximum for an approved leave of absence. A student repeating coursework while on LOA must reach the point at which he or she interrupted studies within the 180 days of the start of the student s LOA. Attendance Reporting Beginning in the fall of 2015, UJ will implement a new attendance reporting procedure. 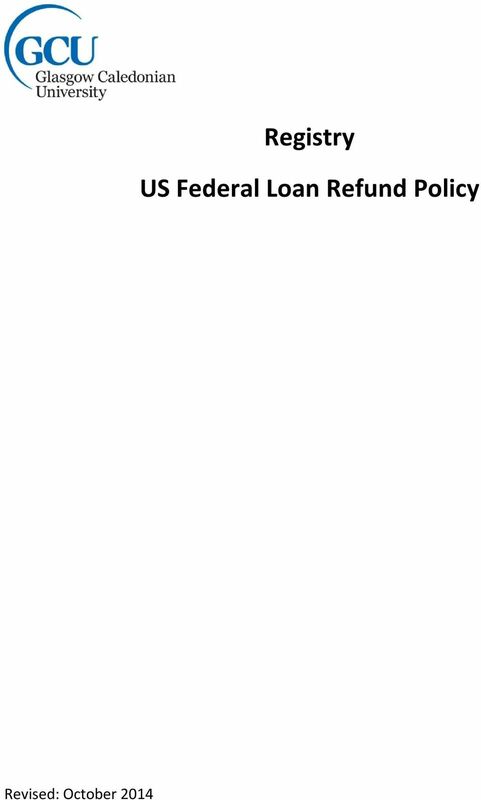 Federal and State Aid Refund Procedures Return of Title IV Funds Procedure Note: This procedure is separate and apart from the State Refund Policy for tuition and fees. State refund Policy: http://supportservices.gtcc.edu/refund-policy/. REGISTRATION AND TUITION POLICIES EFFECTIVE JULY 1, 2015 JUNE 30, 2016 PSY.D. (DOCTOR OF PSYCHOLOGY WITH A CONCENTRATION IN CLINICAL PSYCHOLOGY) REGISTRATION Union Institute & University operates its Psy.D. What Happens If I Withdraw From One or All Of My Classes? What Happens If I Withdraw From One or All Of My Classes? If your invoice is paid using financial aid, and it is necessary to officially withdraw from all classes, please see the Refund/Repayment Policy. FINANCIAL AID HANDBOOK 2015-16 ADVANCED TRAINING ASSOCIATES. 1810 Gillespie Way, Suite 104 El Cajon, CA 92020 619.596.2766 www.advancedtraining. FINANCIAL AID APPLYING FOR FINANCIAL AID ELIGIBILITY FOR FINANCIAL AID. with students by email using our address of ummfinancialaid@maine.edu. Hope International University Online Undergraduate and Graduate Programs Financial Options Guide Welcome to Hope International University. We are pleased you have chosen to complete your education at HIU. Return to Title IV Refund Policy. Determining the Withdrawal Date. What is Title IV? The Financial Aid Award Guide is a reference to help you through the process of assessing your award and planning your finances for the coming year.